Aozora Community Foundation invites you to our 4th Annual Hoshizora "Starry Skies" Gala. Come celebrate with us Friday, March 15th at ShapeShifter Lab in Gowanus, Brooklyn. Grab some drinks, enjoy a variety of Japanese tapas, and witness some brilliant performances. Partake in our incredible silent auction, try your luck on one of our raffle baskets or take home one of our fukubukuro "mystery bags." This year we are raising funds to hire, retain and support the continued development of our educators and staff. It is time that we invest in the educators - the core, the roots of our programs. You witness the energy and effort that goes into each class at Aozora when you bring home a happily-exhausted child at the end of the day. Our hard-working staff need your time and compassion just as they invest their kindness, creativity and love in our kids everyday. This event is open to the public. Please spread the word! All Tickets include admission for one person along with unlimited drinks and Japanese tapas. As a sponsor of Aozora Community Foundation’s Hoshizora Gala, you become a key part of the success of this annual fundraiser. Sponsors receive prominent recognition with an event audience of 175 community members and are featured in communications to more than 800 e-mail subscribers and 2,000+ online viewers. Learn more about our sponsorship opportunities HERE. Drummer and percussionist Barbara Merjan and koto, shamisen and vocalist Sumie Kaneko will fuse the sounds of jazz and Japan under one roof. They will be joined by members of the Kaoru Watanabe Taiko Ensemble, who will share with us traditional taiko drumming songs from Japan and who will accompany us in our annual “Taiko-Off”, which has become a tradition at our galas! Barbara Merjan has performed with various pop and jazz artists in a variety of musical contexts (Lesley Gore, Mark Nadler, Beth Malone, Lea DeLaria, Marian McPartland, Dizzy Gillespie), Japanese taiko (Kaoru Watanabe, Taikoza) and American Contemporary music (Jerome Kitzke, Linda Fisher, Kaoru Watanabe, Amanda Ray). Her extensive Broadway, Off Broadway and touring experience includes the shows Elf, Promises, Addams Family, Cabaret, Mary Poppins, Miss Saigon, Cats, Sunset Blvd., Bed Bugs, the Musical, and Something Rotten! The KWTC Ensemble is made up of advanced students of the Kaoru Watanabe Taiko Center. Members have performed at events such as the Asian Pacific American Heritage Celebration in Chinatown, Mid Autumn Festival in Staten Island, East Fourth Street Community Garden, the Cancer Patients Benefit Seminar at New Jersey Aikido Dojo, and for corporate functions such as Suntory Whiskey and Shiseido. Sumie Kaneko creates music that spans a millennium. A master in the traditional repertoire of these ancient instruments, she has also pioneered their use in jazz and experimental music, through solo and group performances worldwide. 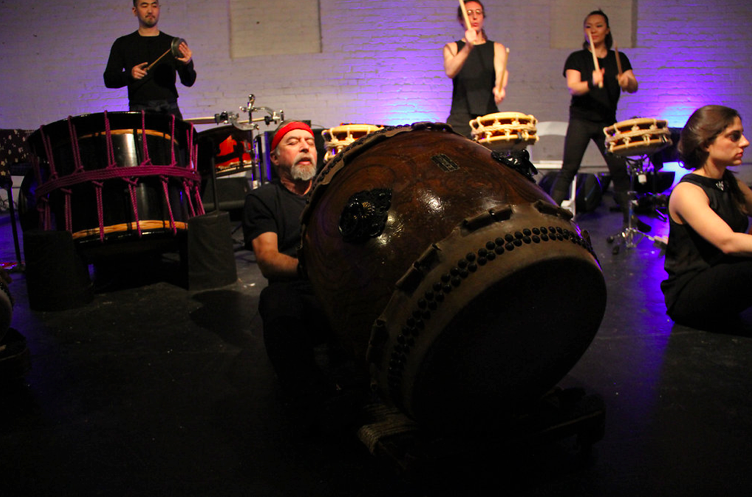 She has collaborated with such artists as Pulitzer Winner Paula Vogel, Gamelan Galak Tika’s Evan Zyporyn, RONIN's Nik Bärtsch, taiko artist Kenny Endo, Kaoru Watanabe, and gidayu-shamisen virtuoso Yumiko Tanaka. Her career started in 1995 as a winner of the Takasaki International Competition in Koto performance. She graduated from Tokyo National University of the Arts, and studied Jazz vocal at Berklee College of Music. She has performed at such prestigious venues as Carnegie Hall, Lincoln Center, Blue Note NY, TED talk, Regattabar, Getty Center, Boston Ballet, Yo-Yo Ma’s Silk Road Project and the Museum of Fine Arts, Boston. She has been performed in South America with Japan Foundation, and every year since 2013 she is invited to Middle East and South Asia from Embassy of Japan. As an educator she has worked with Harvard University, Columbia University, Massachusetts Institute of Technology, Princeton University, Wellesley College, among other institutions. In South Asia, Sumie also visits many of non-profit organizations for street children to encourage future education. Honestly, we know how to feed people. No joke. Ask people who've come to our galas before and they'll tell you the food is deeeelish. Your ticket gets you access to some great Japanese tapas, locally made bites and our bottomless beer and wine bar. Don’t miss out on the sushi rolls, kaarage and other noms, and of course some good good good libations. Put your auction boxing gloves on! Our auction is packed full of an amazing array of products, services and other offerings, many donated by local businesses and individuals who support the mission of Aozora Community Foundation. Check out our Facebook Event page to see periodic postings of photos of some of the items from our growing list of generous donors. If you would like to donate an item to go towards our auction or raffle, please email us at info@aozoracommunity.org. No item is too big or too small. Thank you for your consideration. So, what's this gala all about? Aozora Community Foundation is a 501(c)3 non-profit that dually aims to support Aozora Gakuen services and enhance opportunities for New York-area families to engage with Japan's unique language, arts, and culture. Thanks to our galas and to supporters like yourselves, Aozora Gakuen was able to open a new 3200-square-foot facility in nearby Clinton Hill, Brooklyn in 2017, which services over 60 children and their families. In the short time we've been around, Aozora Community Foundation has extended our Japanese community programming to include adult language classes; cultural and family education workshops and panels; monthly family film screenings; and after-school, camps and weekend classes that serve children 0-9+ years old.